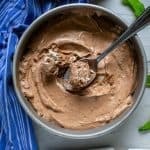 Easy, homemade double chocolate ice cream – no ice cream maker required! Who doesn’t love ice cream? I’ve been a fan since I was little, but my flavor preferences have definitely changed over the years. When I was two my grandpa took me to the store and let me pick out any ice cream flavor I wanted. I chose a gallon of bubble gum flavored ice cream. My mom still tells me about how awful it was. Apparently my chocolate-loving grandpa said that chocolate sauce can disguise bad ice cream, but this was beyond saving. It sounds too good to be true – homemade ice cream without an ice cream maker? Impossible! There’s no way it could work. But it does work! And it’s so good! And so easy! For the double chocolate version you’ll use melted semisweet chocolate, cocoa powder and a touch of espresso powder to bring out the rich chocolately flavor. If you’re averse to coffee, it’s ok to skip the espresso powder. 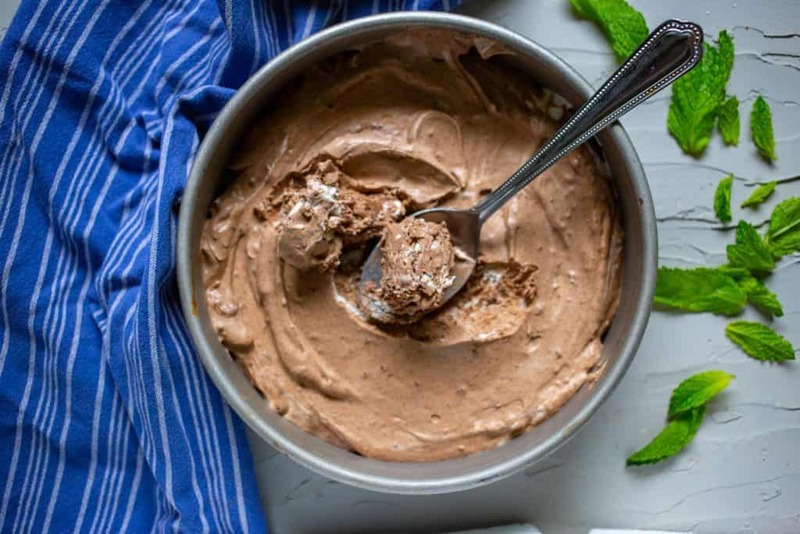 I’ve also added peppermint extract before to make this a double chocolate mint ice cream – so good! Start by whipping the cream. You’ll know the cream is ready when the peaks hold firm. Then mix the chocolate mixture with the sweetened condensed milk and one tablespoon cream and gently fold it into the whipped cream with a spatula. Spoon into a cake or loaf pan and freeze for four hours. Allow to soften for a minute or two before serving. Enjoy on its own, or as an ice cream sundae with homemade caramel sauce, whipped cream, and maybe even some sprinkles. You don’t need much to make this ice cream. Any stand mixer or hand mixer will work. I’ve had a Kitchen Aid mixer for years and it still mixes up even the toughest of batters. If you’re good with a whisk, you could even make this without a mixer. A proper ice cream scoop will help you get nice round scoops. 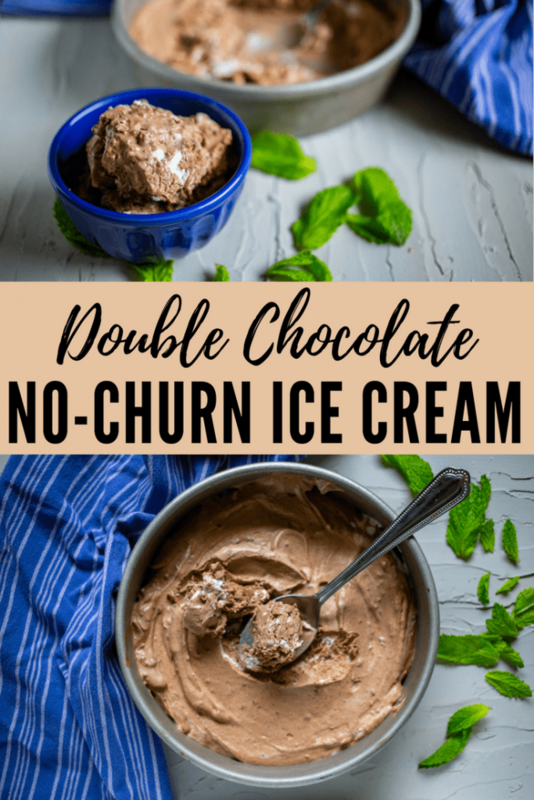 If you try this recipe for easy double chocolate no-churn ice cream, leave a comment and review below and let me know how you liked it. Easy, homemade double chocolate ice cream - no ice cream maker required! Melt the chocolate chips in a microwave safe bowl. Add in the cocoa powder, espresso powder (if using), sweetened condensed milk, and 1 tablespoon of whipping cream. Mix together and refrigerate until ready to use. Whip the remaining cream until stiff peaks form. Drizzle in the chocolate mixture and fold until well combined. Move to a round metal cake pan or loaf pan (metal will freeze more quickly, but you can use a different pan if you want). Freeze for at least four hours. 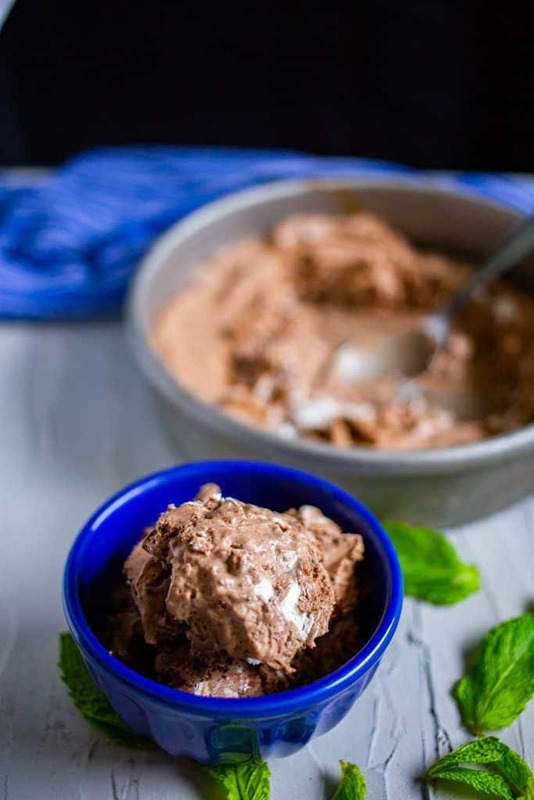 To make mint chocolate ice cream, add 1 teaspoon peppermint extract while whipping the cream. For some extra crunch, top with oreo crumbles or chocolate sprinkles. Ice cream lover over here! I’ll bet that hint of espresso adds a ton of depth! This looks perfect! Love that it’s no-churn too… I still haven’t tried this though, so thanks for the inspiration! I agree, I start to like chocolate and caramel flavors more and more, too. Super yummy recipe! What I wouldn’t give for a bowl of this right now! That ice cream looks so creamy and delicious. It’s only 8am but I am craving ice cream. Delish! The problem being is that I would eat the whole thing in one sitting! Thanks for sharing! Your mom served this at dinner tonight…. WONDERFUL!!!! A scoop of this would be good in a cup of coffee. I’m glad you liked it! I agree, this would be excellent in a cup of coffee. This looks astoundingly good! Coffee and chocolate ice creams are my favorites, this combination is sure to kick both of them to the curb. I am trying this for sure!